Puppy Socialization, Optimist or Pessimist? Puppy Socialization: There’s a new puppy in the house! While we’re still grieving the loss of our amazing girl, Willow, it seems the stars aligned to lead us to Cailie. 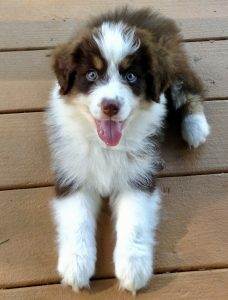 Cailie is a now 14-week old Australian Shepherd puppy who joined our home at 8 weeks. She’s helping us create some new memories, even while our hearts are still heavy. Cailie is quite the handful, as most puppies are. We’re celebrating the ability to watch her grow and change daily right before our very own eyes. It’s fascinating! Let’s talk about puppy socialization. You’ve heard it’s important and it is! The prime period of socialization for a puppy is the first three months of a puppy’s life. That’s when appropriate puppy socialization and training should commence so that unwanted behaviors are prevented. We call early puppy socialization and training “behavioral vaccinations”. 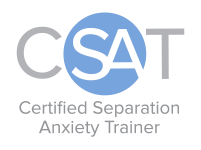 However, it must be “appropriate” socialization, which takes careful thought and planning. When embarking on a puppy socialization journey with your puppy you must have the ability to be able to read your puppy’s body language to understand if she is 1) truly comfortable (if so, continue); 2) merely feeling “ok” about the experience (find a way to help make it even better, perhaps yummier food); or 3) feeling uncomfortable (head home). Getting to know your puppy BEFORE embarking on an outing is important. After a week in our home and doing our very best to pair all her new experiences with “good stuff” (think associative learning), she’s quite the confident pup. We’ve had friends and clients over to the house and she’s met another 6 month old puppy. 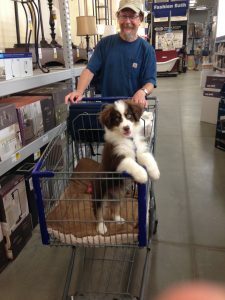 We then felt it was time to hit the road and take her to Lowe’s (thank you for being pet friendly!). Ahead of time we planned for her comfort in the crate while in the car (favorite toys, chews and water). Once we arrived and were getting her out of her crate, we were ready to pair any new sound or sight with a tasty piece of food. We took her crate pad to put in the buggy, along with a chew and a toy, and off we went (rolling paradise). You can see the result. Happy puppy with a brand new experience. Puppy Socialization Mission Accomplished!